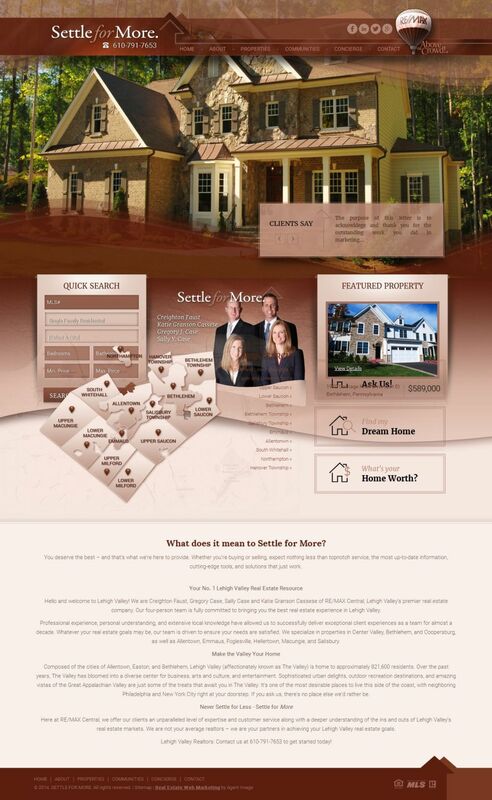 Settle For More, a trusted real estate company in the Independence State, has unveiled its brand new website S4more.com. It showcases the lovely homes of Lehigh Valley with features that help clients look for residences in the area. As important, the website shows Lehigh Valley as a progressive metropolitan area filled with arts, culture and amazing views of the Great Appalachian Valley. It’s now easier than ever to look for homes in the Pennsylvania region of Lehigh Valley. Four of the Valley’s top realtors – Creighton Faust, Gregory J. Case, Sally Case and Katie Granson Cassese – have brought more than 40 years of combined real estate experience in the development of their new website S4More.com. Bethlehem, Lower Saucon Township, Salisbury Township, Upper Saucon Township, and Easton. As experts on everything Lehigh, the team has created a website that answers a prospective client’s every need, foremost of which are single-family homes, lots and land, multifamily residences, commercial properties, and rentals found in the area. “We also filled S4More.com with every useful tool and convenience we could think of to make sourcing properties a lot easier,” says Creighton Faust of Settle For More. Some of the helpful features on the website include a Concierge page that lists down the local vendors, schools, entertainment venues, restaurants, hospitals, parks, and shopping centers in the community. The Properties column on S4More.com drops down to reveal pages for virtual tours, current listings, sold properties, and a customizable MLS search tool. Every useful feature is just a click or a tap away, thanks to S4More.com’s intuitive design. “As important, the website shows Lehigh Valley as a progressive metropolitan area filled with arts, culture and amazing views of the Great Appalachian Valley,” said Settle For More partner Gregory Case. “Lehigh is also a short drive away from New York and Philadelphia,” he added. For more information on what makes Lehigh one of the most desirable places to live in the East Coast, visit http://s4more.com/ or call 610-791-7653.